Step 1: Begin by poking a hole straight through the styrofoam ball. Step 2: Fold a piece of ribbon in half (approx. 20-24" long - 10-12 folded) and using the pencil again - poke the folded end into the ball. Step 3: Tie the loose ends of the ribbon together to form a large knot to "sit on". You can tie a small knot on top, but I think it's prettier without it. Just know it can come out without a knot on both ends. Step 4: Take 1 pin in hand (holding the ball of the pin head) and choose a small sequin to "thread' onto the pin. Step 5: Then take a larger sequin to thread onto the pin. Step 7: Repeat steps 5 & 6 as interest, supplies and space allows. 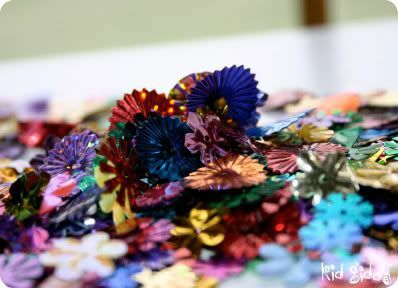 This is a great craft for kids with a good level of Fine Motor skills (not a beginner level). Again - please - supervise your kids if you are letting them do the crafting! Have a great weekend...See all you thumbsucker parents tomorrow for your chance to win a free ME Thumb Cover to break the habit! Oh I LOVE it! And that is right up my little girl's alley! Thanks for the great tuttorial! Have a great weekend! These are beautiful!!! We did a neat styrofoam tree with buttons and pins! I love this! I love those styrofoam balls! 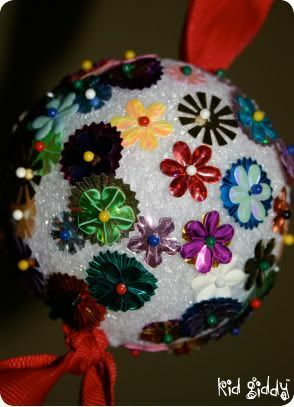 I remember making so many kinds of ornaments with them as a child! 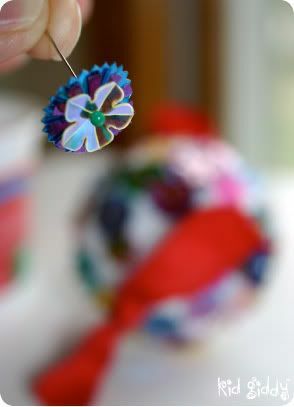 I included this idea in a roundup of homemade ornaments a kids can make. Thanks! !